I’d had plenty of dating misadventures, but this was the first time I ended up down a literal manhole. I had been on one brief, blind date with a guy who didn’t seem interested. But he was my exact age, gainfully employed, and adventurous, so I had to consider it, if I didn’t want to die alone. What would it be like, asked my therapist, to describe what you want to attract in the present, instead of naming what you fear most in the future? Tim’s and my first encounter was a quick lunch in the employee cafeteria of the large corporation where he worked. The employee cafeteria made the lunch feel less like a date and more like a business meeting. I had to wear a tag with my name and his name on it. There were little clips for the name tag in the company’s primary colors in a Lucite case on the front desk. I chose a green one. We sat outside on a roof deck, where we could see the bay and the bridge. He told me he played underwater hockey. I congratulated my date on having a unique hobby. I congratulated myself on being open and curious. I could see my reflection in the glass wall of the employee cafeteria. I was having a good hair day. My date was having a bad hair day so epic it qualified as all-time. He had not combed his hair for our date/business lunch, and maybe not possibly ever. But maybe that was because he was a renegade, despite working for the large corporation. A renegade with stock options — the best kind. His uncombed hair reminded me of someone, but I couldn’t remember who. I went out of town on a week-long climbing trip. Tim didn’t get in touch while I was away, but I made myself email him when I got back. I wanted to be guided by instinct and desire, but my instinct and desire had led me to guys who acted like relationships were an impossibility of physics akin to cold fusion. If I let my instinct and desire guide me, my last viable ovum would unceremoniously expire while a twenty-eight-year-old five states away texted me pictures of his new bass. What would it feel like, asked my therapist, to be present with the discomfort of uncertainty, instead of the familiarity of using the sharp edges of your worst fears to inflict emotional self-harm? An adventure! I applied mascara and grabbed my headlamp. Saturday nights were always bad for writing, anyway. Unless I had a deadline on Sunday, I gave up quickly. Giving up meant I read an entire New Yorker and most of the New York Times, then smoked a joint, sighed at the moon, rubbed one out, and woke up relieved that another Saturday was over, and it was time for Sunday morning yoga. The universe, said the astrologers, was listening to our deepest intentions when the moon was a certain shape. If I whispered my deepest intentions to the universe by putting on mascara at 8:45pm on a Saturday night and leaving my house, the universe might hear. The universe might even oblige. Sometimes people on dating apps said they were looking for “activity partners.” That seemed lower pressure. Maybe I wasn’t looking for a date, a lover, a best friend, a boyfriend, a partner, a husband, or a father for the children I wanted to have, but not all by myself. Maybe I was looking for an activity partner. Maybe if I did enough activities, the partner would — . I couldn’t think of a verb for what the partner would do. The best I could do was to type two hyphens in a row and let my computer AutoCorrect them to the em dash Emily Dickinson had used in all those poems she wrote, alone in her room, that nobody read until after she was dead. I was named after her. I was supposed to be Rachel, but in my mother’s eighth month, my parents watched a documentary about the virgin poet, and so I am Emily. The partner would do whatever it was that was on the other side of the other Emily’s em dashes. My activity partner was wearing a backpack, walking a bike. His hair was just as messy as it had been the day we had lunch in the employee cafeteria. Now, I remembered what his hair reminded me of. It was an extended family gathering in the mid-nineteen-eighties, in a cramped apartment in a tall building in an outer borough of New York City that smelled like split-pea soup. Playing cars with my brother on the living room floor, I drove my miniature El Camino into a foot with a saggy sock and a pale ankle. The relative to whom it was attached did not react, but loomed above, frozen on the couch. His mouth was slightly agape, his face at once blank and horrified. His hair was a snarl, a nest. I went over to my mother, pulled her sleeve, whispered. “Because he’s schizophrenic,” said my mother. For many years after that, I thought schizophrenic meant a person who had very messy hair. For my mother’s cousin Carl, it meant that he ate only grapefruit. One day, he told his mother that he couldn’t take much more, and that she would be all right. Soon after, he jumped off the roof of one of the tall apartment buildings in the outer boroughs that smelled like split-pea soup. What would it be like, asked my therapist, to show up to meet someone as you would hope they would show up to meet you? “Hey!” I said to my activity partner. I smiled. There were other reasons to have messy hair, besides schizophrenia. Like wind, or riding a bike. My activity partner didn’t smile back. He led me to a park behind a restaurant, locked up his bike, and removed some tools from the backpack. Then he knelt down on the ground and starting prying up a manhole cover. “That’s where the creek is,” said my activity partner. We were not, as I had imagined, going for a walk in the moonlight by a creek in the woods. The creek was in an underground culvert. We were going down in the hole. “That’s where the creek is,” my activity partner said again. Lean in, wrote the billionaire feminist. Face fear. I had nothing better to do, anyway. “Do you have a headlamp?” asked my activity partner. “Of course,” I replied. I was a good activity partner. Prepared. Fun! I would show this new activity partner that I was fast and strong and not afraid of anything and never forgot my headlamp, even though really, only the last part was true. What would it feel like, asked my therapist, to be enough just as you are? I was scared to go down the manhole, but maybe I had cause to go. There was an odd symmetry at work. I had wasted 75% of my thirties on a dozen non-relationships, mostly with men who shared my climbing addiction. I had gone up all those rocks and mountains with all those guys who refused to perform the scientific miracle of relationship cold fusion. But maybe I had been going in the wrong direction. Maybe, seeking different results, I should instead go down. We might all need to spend more time subterranean. Not infrequently, the unhinged president would unleash idle threats on the internet that seemed as if they could conceivably lead to nuclear annihilation. Going down the manhole would be good practice for the worst case scenario. Or maybe, if I metaphorically descended into the underworld, I could face and conquer my fear of enclosed, underground spaces, or my related fear of intimacy, or my not-unrelated fear of loneliness, and heal the wounds brought up by Pluto’s recent retrograde. I could think of lots of reasons to go in the hole. 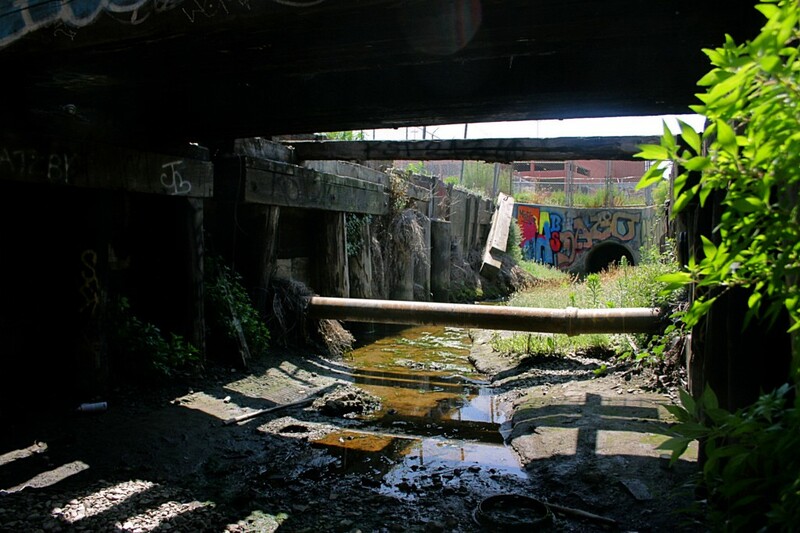 I stepped into the manhole and climbed down a ladder until I was standing at the bottom of a tunnel, ankle-deep in a three inches of fresh, moving water. The air was cool and moist and smelled sweetly of creek. The ceiling was high and arched and made interesting acoustics. Though I had feared it would feel like a sewer, it was more like a cathedral, or a crypt. The graffiti on the wall at the bottom of the ladder said, FEAST ON YOUR BLOOD. I asked my activity partner if he had been down here before, and he told me he had been to a secret art show once. I asked why we were in the tunnel, and he said he thought he could take a boat down the creek, all the way to the bay. I asked how he could get a boat to float in three inches of water, and he said maybe after it rained. My activity partner started walking faster, and soon he was twenty paces ahead. To slow him down, I pointed out a root that had pushed its way into the tunnel through a crack in the concrete. “When something wants to grow…” he shrugged. He took off again, walking faster than I could. I felt lonely and left behind. Be present with what is, I thought. Maybe this activity wasn’t about my activity partner. Maybe it was about the activity. I listened to the rushing water and the distorted sounds of cars thudding above us. The way the air was moving through the tunnel sounded like voices. My mother’s cousin with the messy hair and the schizophrenia had heard voices, telling him to jump. He jumped. Virginia Woolf had heard voices telling her to put rocks in her pockets and walk into the River Thames. She drowned. No voices had told me to go down this hole. I was trying to talk to the universe, not the other way around. But I wasn’t even conversing with my activity partner. I was walking alone, talking to myself. I wanted to know when this long, lonely walk might end. “Excuse me,” I called into the darkness. I had almost forgotten my activity partner’s name. “Tim!” His light stilled. I caught up, sloshing through the water, and asked how far he intended to go. All the way to the bay, he said. I had just come from the bay, noting that it was a distance of 3.6 miles. Using the skills of voicing my needs and speaking my truth that I had been working on in therapy, I politely told my date that I did not want to walk 3.6 miles in the underground culvert. I didn’t want to disappoint. “I think I can probably find my way back to the manhole cover where we came in, and let myself out,” I said. “Then you can keep going. I know where it is. It’s where it says, FEAST ON YOUR BLOOD. “That wouldn’t be very responsible of me,” sighed my activity partner. We turned around and started walking the other way. It wasn’t very far to FEAST ON YOUR BLOOD. I climbed the ladder to the top and braced my knee against the side of the vertical tunnel so I could push with both hands. I used my climbing skills, thinking with my body about the angles and the vectors. With a scraping noise, the manhole cover began to move. It took all of my strength to push it up and wriggle it aside. Rust and dirt rained down into my mouth and nose. How can you come into new moments without bearing the full weight of the past? my therapist had asked. I hoisted myself out of the hole and spat out the rust dust. The air above smelled different from the air below. Despite hardly having touched my activity partner, the evening had been an embodied experience. I knelt down, leaned over the open manhole, and whisper-shouted, “Thanks for showing me the underground creek, Tim! Have a nice walk!” Then I dragged the heavy iron disc back over the hole and gave it a little pat, like I was tucking him in. I drove home in silence. There was no soundtrack for this aftermath. When I got home, I didn’t turn on any lights. I wiped off the rust, removed my mascara, and climbed into bed. It was still Saturday night, a dreadful time for lonely people. Down in the hole, I had been the most lonely. I was still lonely. But at least I was aboveground, where I could see the sky, and walk among the living. Emily Meg Weinstein’s writing has also appeared in Salon, The Billfold, McSweeney’s, The Rumpus, Electric Literature, and Climbing magazine. Follow her on Twitter @emilymweinstein.